Packing, Packing, and more Packing. Did I say packing? Yes, we're packing. Icky packing. Our home is now boxes and boxes. 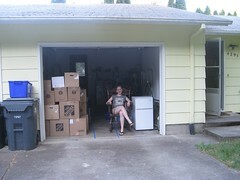 Today, we moved the boxes to the garage now too so the place is empty (almost). Yuck boxes. And also, a farewell to the rocking chair. It's going to good hands. Bye Bye childhood rocking chair. I'll miss you (but not your space-eating ways).